Paper Road/Tibet is an organization dedicated to reintroducing the are to paper making in the Tibetan style back into Tibet. For more information on this very worthy project see their home page at Paper Road/Tibet. The sound and slide show on this page provide you a nine minute pictorial journey to Tibet. 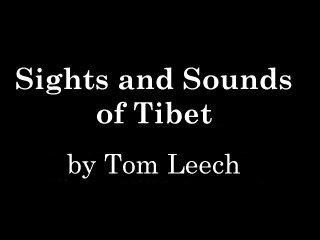 The pictures and sounds were assembled by Tom Leech and his friends and co-workers in Paper Road/Tibet and the (now disbanded) Everest Environmental Project during their many visits. It is part of a narrated hour and half presentation that Tom Leech has shown all over the country. Tom gave TSL members a special showing and we felt that it would be wonderful to make this part of his program available on our internet site. Because of the limitations imposed by current modem technology, please understand the quality of audio and video presented here is less than that of the actual photos and sounds used by Tom. To make this slide show as compatible with the internet and your hardware as we can, it is available here in two different formats, represented by the darkened screens below. The first option is designed to be run on a 28.8 modem. The bottom picture has better sound and picture quality and is encoded to run on 56K modems or an ISDN or faster connection. The slide show is presented in Real Video format and requires you have their "Real Player" plug-in installed which can be downloaded at no cost from the Real Network home page. See their logo below. Download "Real Audio Player" Free.